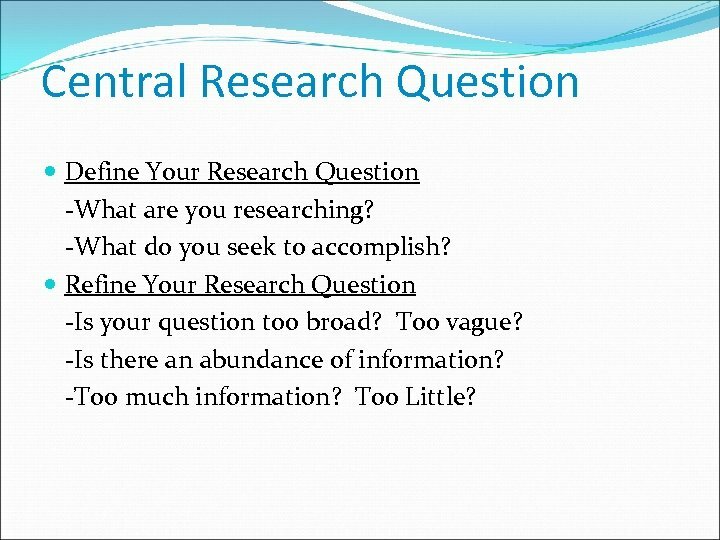 Central Research Question Define Your Research Question -What are you researching? -What do you seek to accomplish? 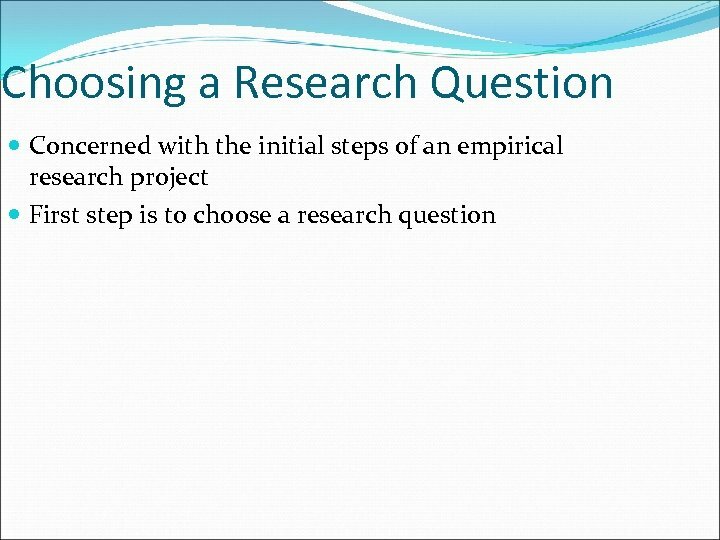 Refine Your Research Question -Is your question too broad? Too vague? -Is there an abundance of information? -Too much information? Too Little? 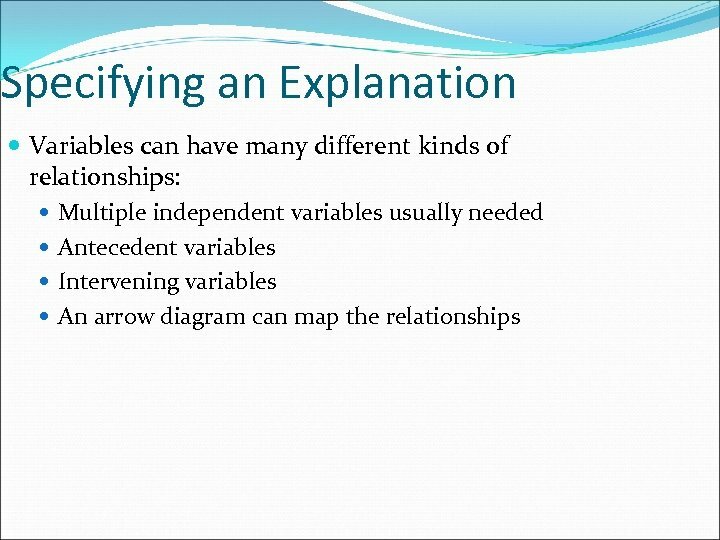 Specifying an Explanation How are two or more variables related? 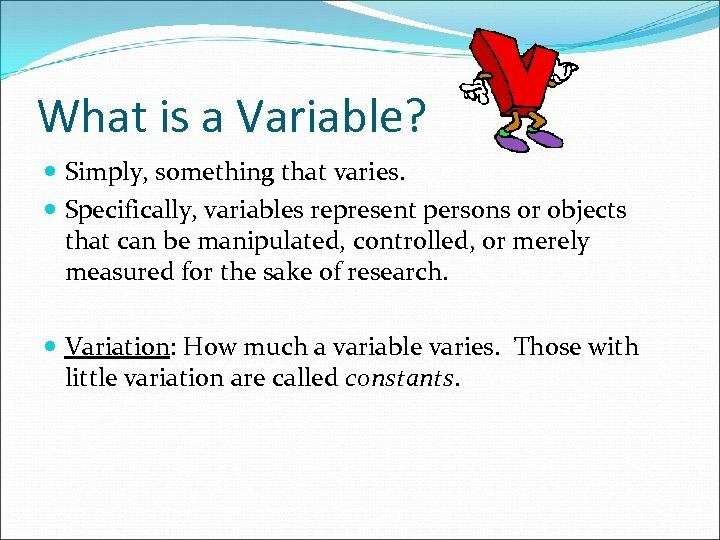 A variable is a concept with variation. 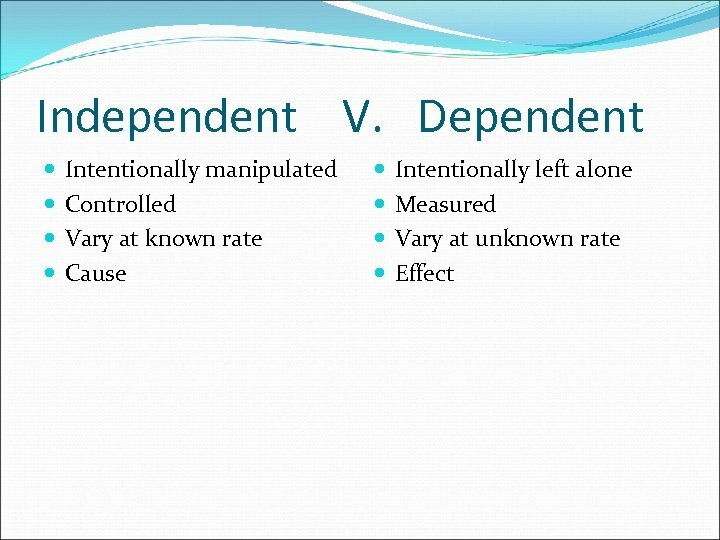 An independent variable is thought to influence, affect, or cause variation in another variable. 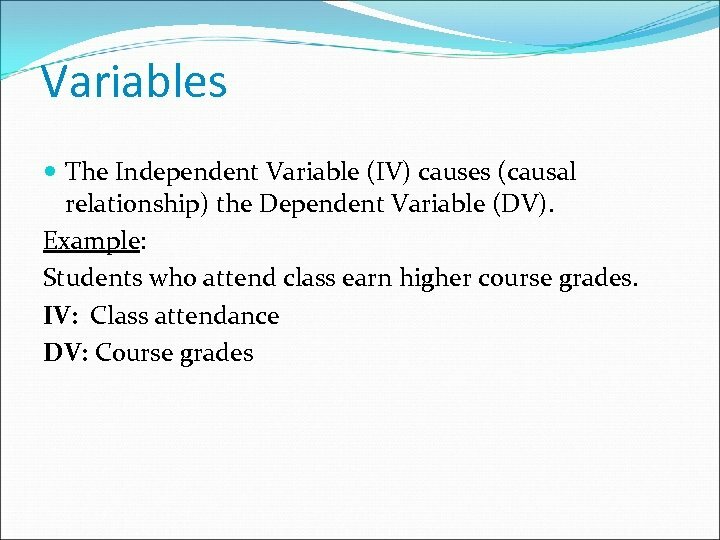 A dependent variable is thought to depend upon or be caused by variation in an independent variable. 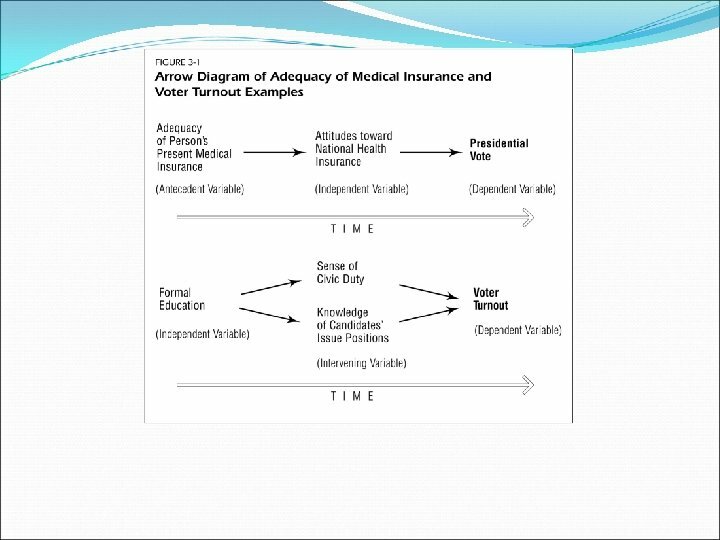 Specifying an Explanation Causal relationships are the most interesting. 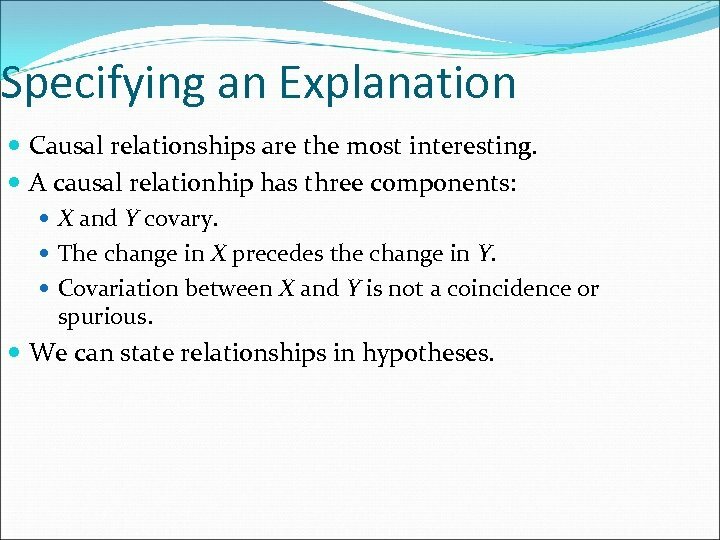 A causal relationhip has three components: X and Y covary. The change in X precedes the change in Y. Covariation between X and Y is not a coincidence or spurious. 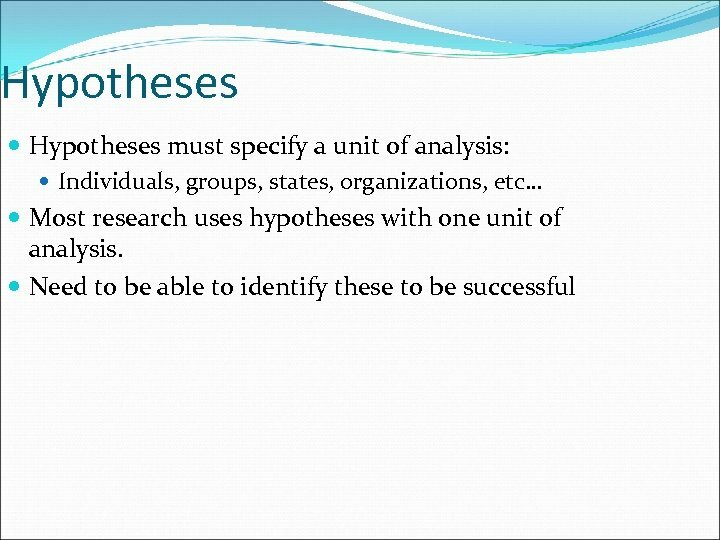 We can state relationships in hypotheses. 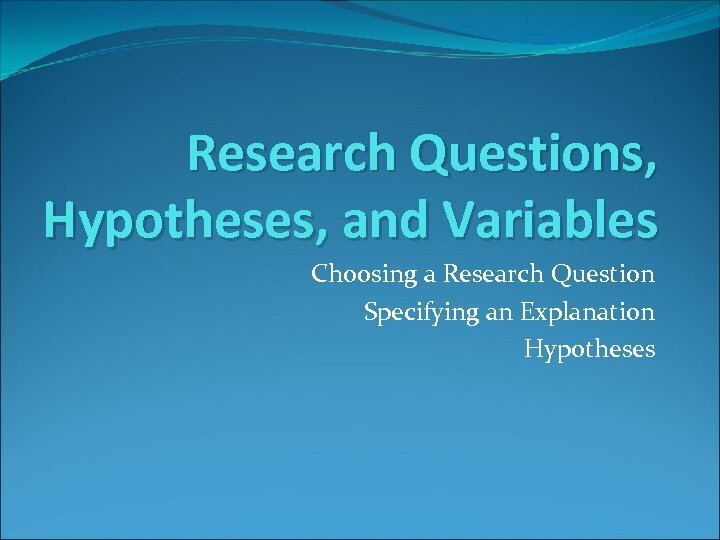 The Hypothesis Makes a prediction Most research questions, however, formulate more than one hypothesis. 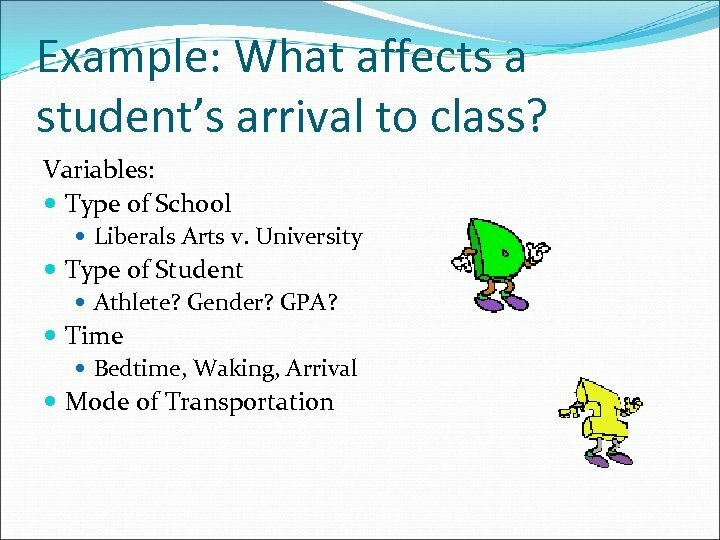 Attendance, along with solid study habits and ample rest could also influence course grades. 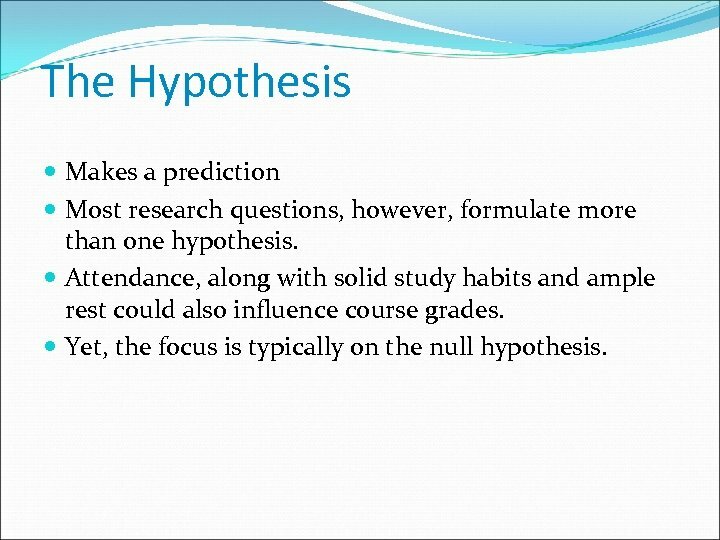 Yet, the focus is typically on the null hypothesis. 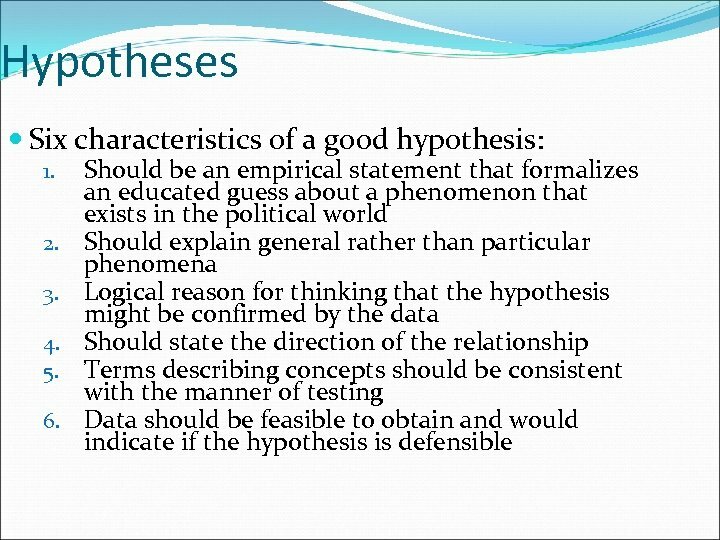 Null Hypothesis A hypothesis of no relationship Prove or disprove the null hypothesis to show support or opposition to your actual hypothesis. Why? 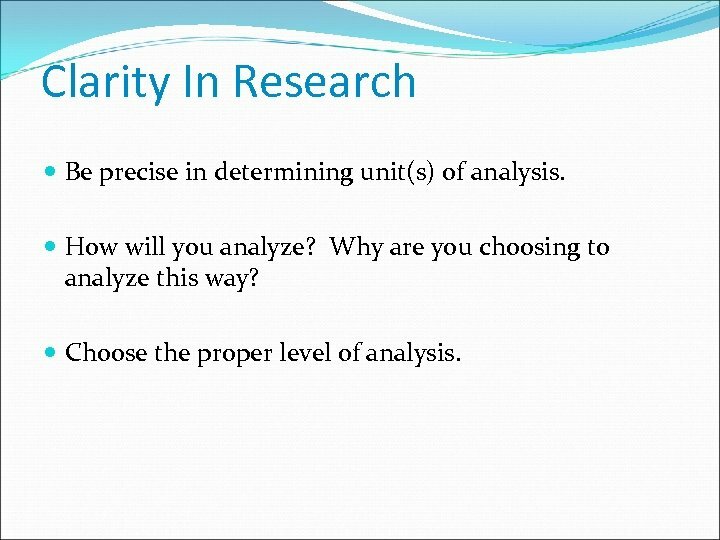 Clarity In Research Be precise in determining unit(s) of analysis. How will you analyze? 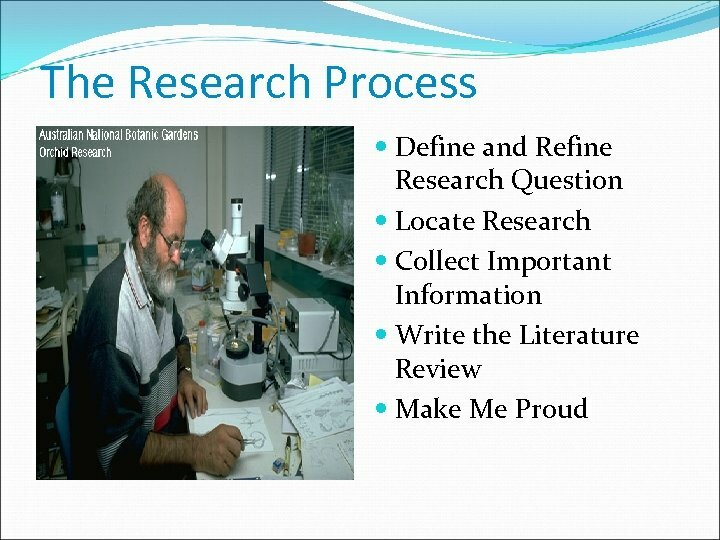 Why are you choosing to analyze this way? Choose the proper level of analysis. 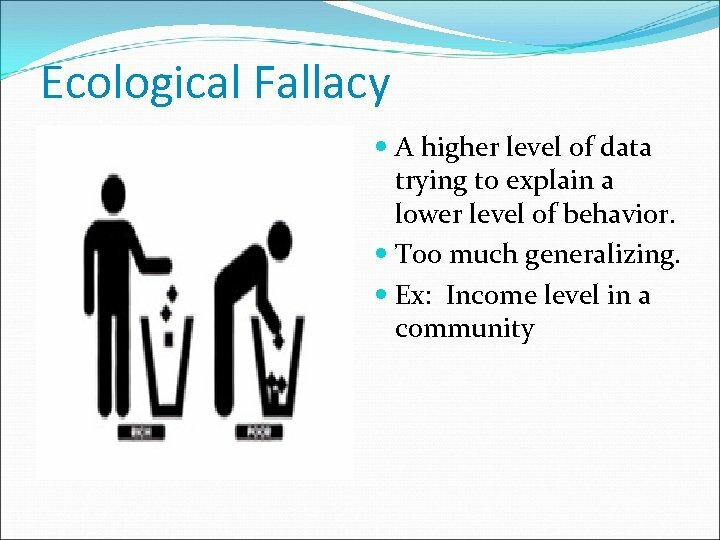 Reductionism A smaller level of data trying to explain a higher level of behavior. 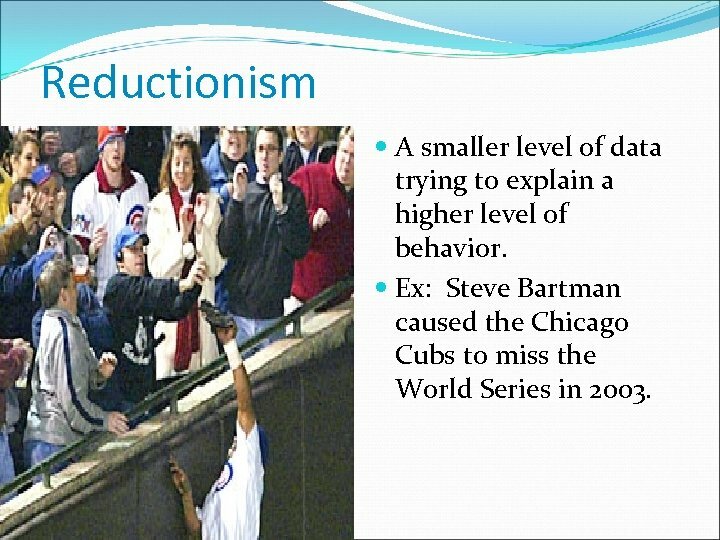 Ex: Steve Bartman caused the Chicago Cubs to miss the World Series in 2003. Spuriousness A false relationship; a relationship that appears but is not. 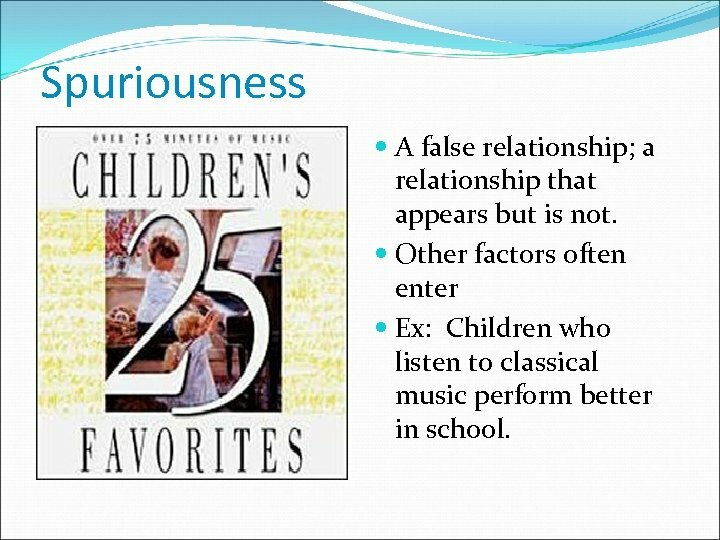 Other factors often enter Ex: Children who listen to classical music perform better in school. 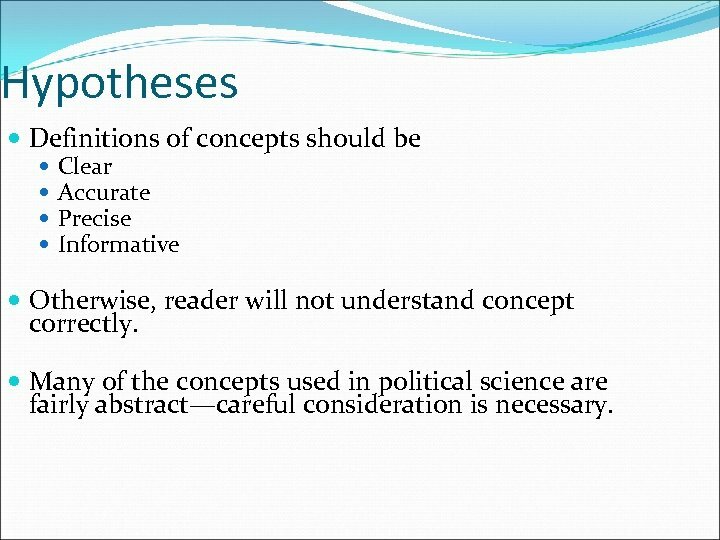 Hypotheses Definitions of concepts should be Clear Accurate Precise Informative Otherwise, reader will not understand concept correctly. 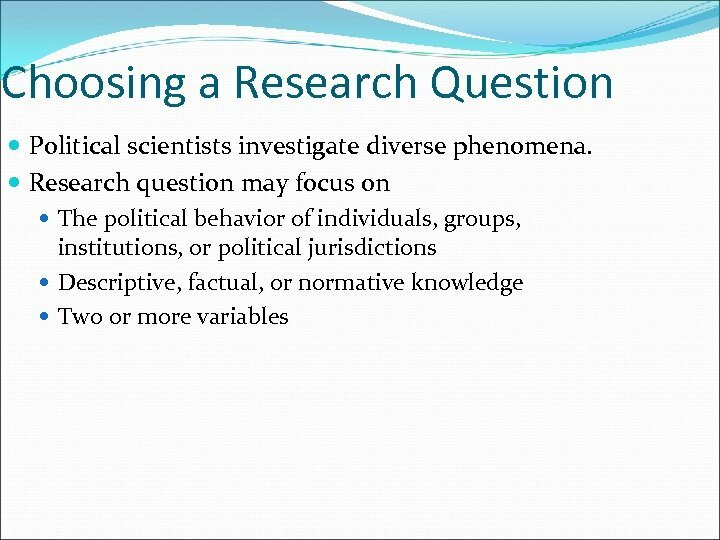 Many of the concepts used in political science are fairly abstract—careful consideration is necessary. 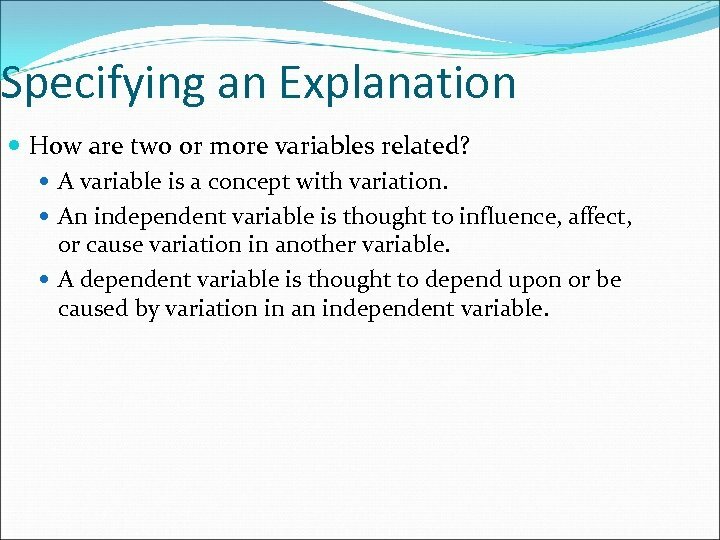 What is a Variable? Simply, something that varies. 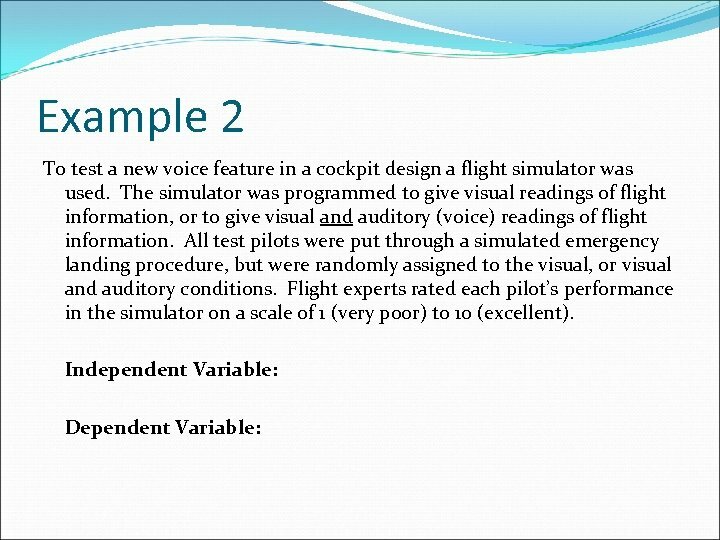 Specifically, variables represent persons or objects that can be manipulated, controlled, or merely measured for the sake of research. 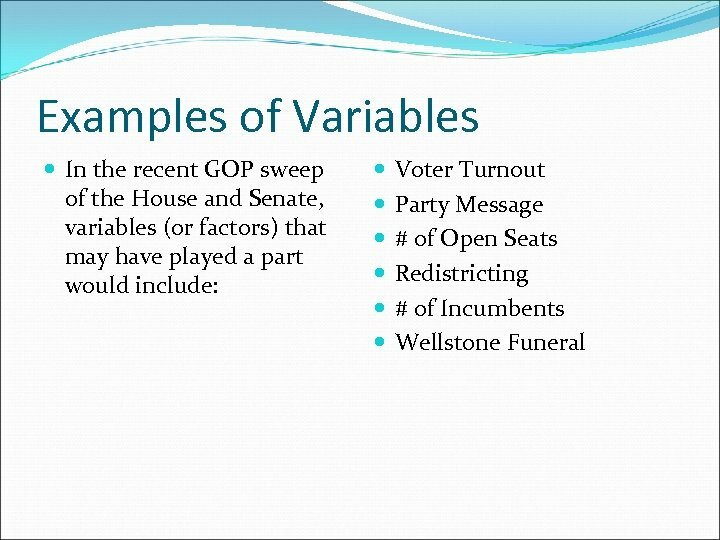 Variation: How much a variable varies. Those with little variation are called constants. 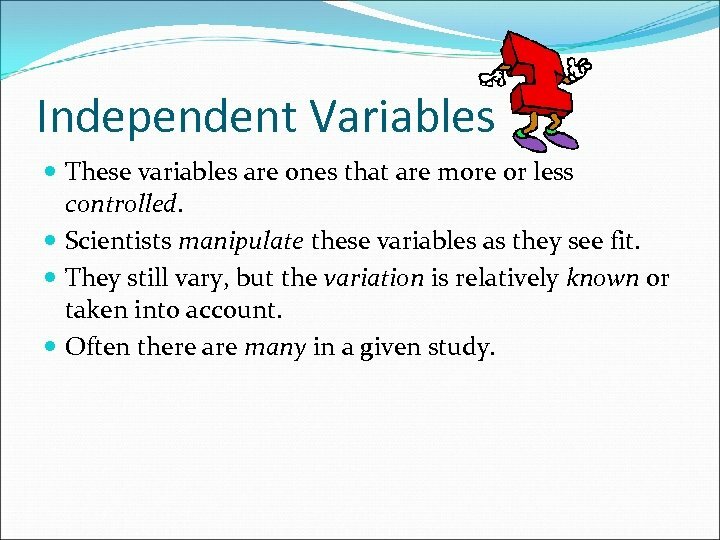 Independent Variables These variables are ones that are more or less controlled. Scientists manipulate these variables as they see fit. They still vary, but the variation is relatively known or taken into account. 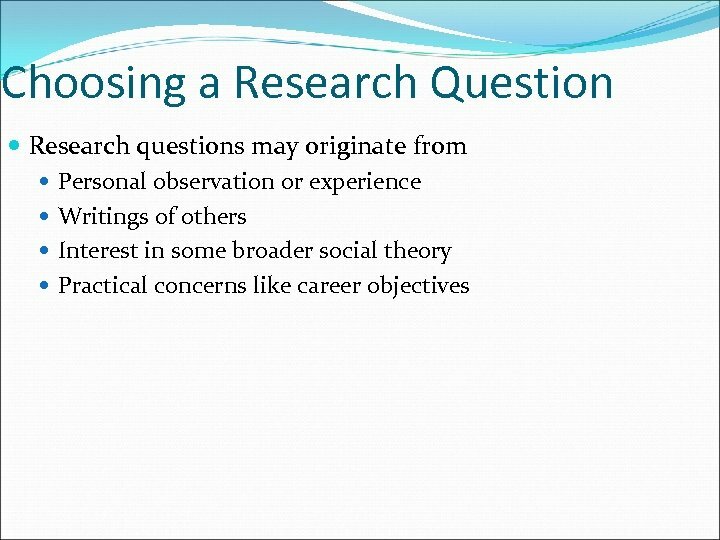 Often there are many in a given study. 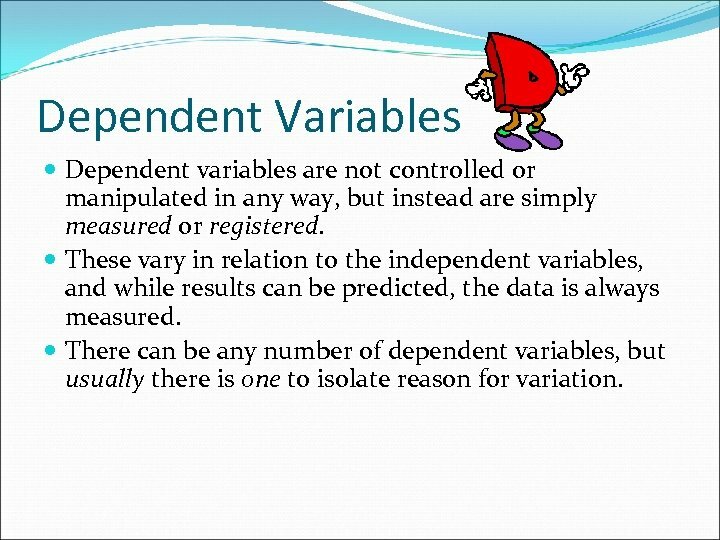 Dependent Variables Dependent variables are not controlled or manipulated in any way, but instead are simply measured or registered. 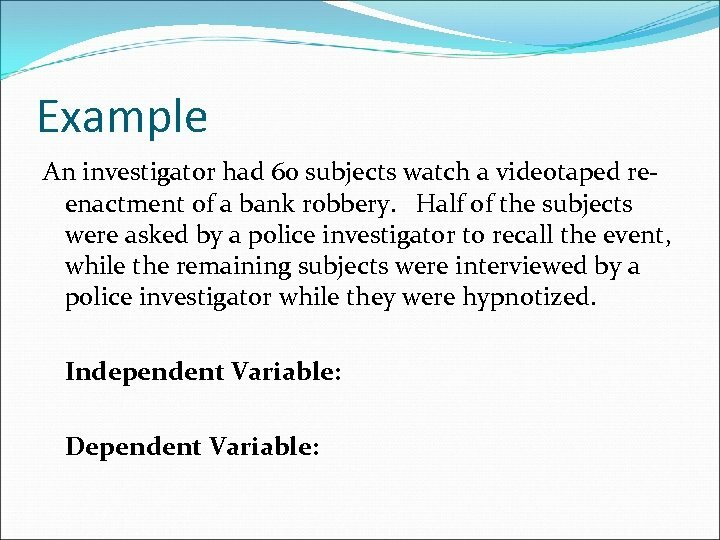 These vary in relation to the independent variables, and while results can be predicted, the data is always measured. 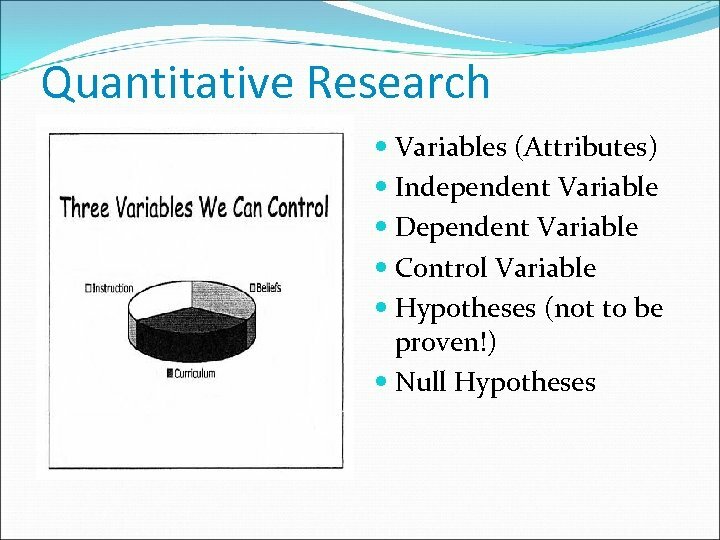 There can be any number of dependent variables, but usually there is one to isolate reason for variation.